More banknotes were produced in June than in any month since October, data from the agency that prints U.S. currency shows. 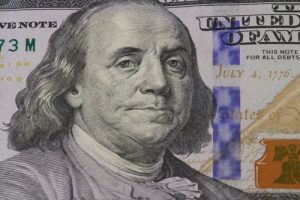 656 million in $1s, $2s, $5s, $10s, $20s and $100s were printed last month for a combined value of more than $13.6 billion, according to Bureau of Engraving and Printing (BEP) figures published on Monday, July 11. In contrast, May levels registered with 605.44 million notes worth over $12.7 billion. $50s were not printed for the first time since March while the number of $10s matched for a third month in a row. Compared to the same month a year earlier, the number of notes grew 13.8% but their combined value fell 34.6%. The BEP printed 9.6 million star notes, split across $1s and $2s. Star notes are replacements for misprinted or damaged notes and for certain serial numbers like 000 000 000. They have serial numbers that end with a star “*” designation, and are also so indicated by quantities in the images above. Money collectors usually find star notes more desirable since they can be harder to find. According to data from the Federal Reserve, there was approximately $1.46 trillion in circulation as of June 1, 2016, of which $1.4 trillion was in Federal Reserve notes. The bureau have issued so many $2.00 note and yet we can not exchange it from the banks. I wonder who’s get it?. Anyone?.. It is a mystery where all these $2 FRNs go that are put into circulation. I haven’t seen one in circulation for years! I buy the special $2 notes with fancy serial numbers & uncut note sheets directly from the BEP. Today I received my BEP 2016 fancy serial number $1 birthday notes that went on sale July 6 from the BEP beginning with numbers “2016” as the first four digits. The embossed folder is colorful & includes a big red envelope to use for mailing as gifts. It is limited to 5,000 sets & I got 5 consecutive numbers in the low 0350 range. I just ask @ the BANK & get $2 all the time, last visit a fresh pad of 100 w/a BEP strap from “I” although I am in the L district…….great for tips! You are so right! Former Treasurer of US Katharine Davalos Ortega is auctioning off her collection of special serial #1 notes she received while in office & the printing plate with her engraved signature used to print notes! They are offered by Heritage Auctions at next months ANA coin show & convention in Anaheim, California. How scandalous is that? She got some of them free as a gift & some she got for face value while in office. Amazing! Ditto here. I live just outside a major city (also a Fed district seat if that matters) but even at major banks, asking for twos usually gets the same response as a request for a roll of buffalo nickels. It takes some searching, but there are still a few banks out there interested in providing customer service. As soon as I found a bank that would get me $2 bills and half-dollars on demand, I parked the vast majority my money with them. I’ll admit I have a second account at another bank with a good coin counter to dump the really bad-looking half-dollars in while I spend the rest/give them out in change at work. The rumor I’ve heard about $2 bill circulation is that they’re used in Gentleman’s Clubs so that the dancers will get better tips. Can’t say I blame them. A dollar doesn’t mean much anymore. But production of the denomination has increased over the years. We’ve had several consecutive series now. Good info! Dancing for $2 bills – a new tv reality show in the making. Lol. Interesting! I guess it’s like the saying “everything old is new again”. Supposedly one of the reasons $2 bills lost favor around the end of the 19th century was that they were used to pay for, uh, “gentlemen’s entertainment” back then as well – but it was, hmmm, a rather more substantial form of pleasure. People stopped spending the denomination due to fear of guilt by association. Interesting! Benjamin Franklin must have had his pockets full of $2 bills at all times, as he was a frequent “guest” at houses of ill repute all over the place (one of his many hobbies! ) & he was a fairly wealthy man.